Hives are an outbreak of red blotches on the skin. They can be less than an inch in diameter to greater than twelve inches size and can be found anywhere on the body. You may not feel them or they may be intensely itchy. They can often move around or come and go right in front of your eyes. Unlike most other rashes, pressing on an area of a red hive may cause it to blanch white. Hives are often due to an allergic reaction to foods such as nuts, chocolate, eggs, fresh berries, and milk to name a few. Medications such as penicillin and sulfa also commonly cause hives. Physical stimulation of the skin from rubbing, scratching, pressure, cold, heat, and even exercise can cause a hive reaction. Another condition called angioedema is similar to hives but involves swelling just beneath the skin, most commonly around the eyes and lips but can sometimes involve the hands and feet. Hives and angioedema are both caused by a release of a chemical called histamine which can leak out of small blood vessels in the skin as a response to an allergic or physical stimulus. In the short term, hives and angioedema are treated with over the counter antihistamine drugs such as Benadryl, Chlortrimeton, or one of the newer non drowsy drugs such as Claritin and Allegra. If either hives or angioedema persist (chronic urticaria), then a cortisone drug such as prednisone could be prescribed by your doctor. In rare cases, hives can be the precursor to a condition called anaphylaxis, a severe allergic reaction that can cause immediate death such as seen in a person who dies from a bee sting. A person undergoing such a reaction needs an immediate shot of a drug called adrenaline, which can be either self injected by use of an Epi-Pen, or treatment by emergency personnel. The same urgency and treatment goes for severe angioedema which can cause life threatening swelling around the lips, mouth and throat. One of the best ways of dealing with hives or urticaria is to avoid known triggering factors such as certain foods, drugs, or physical stimuli. For anyone affected by either of these conditions, a referral to an allergist will be necessary for proper diagnosis and treatment options. I’d like to make my annual plea for the liberal use of sunscreen to protect all of us — young and old — from the damaging effects of the sun. Please understand that the “healthy” bronze tan color that many people seek is actually how the skin demonstrates that it has been damaged by the sun. The sun produces two types of invisible light. One is ultraviolet A (UVA), which is the ray that produces a tan but causes skin damage and aging, (think wrinkles and “old age” skin spots). The other is ultraviolet B (UVB), which causes the uncomfortable sunburn. Both types can cause skin cancer, especially the deadly melanoma. This year in the U.S. there will be approximately 76,000 new cases of melanoma with some 9,000 deaths. These statistics can be reduced significantly by protecting our skin from the sun. The damaging rays from the sun are most intense between the hours of 10 AM and 4 PM. Always start the summer season with a new fresh tube of sunscreen; price has nothing to do with performance. Use a sunscreen with an SFP rating of at least 30. Higher than 50 is probably not necessary. A sunscreen should be labeled “broad spectrum” protecting against both UVA and UVB and be water/sweat resistant. Use at least 1 ounce (2 tablespoons) for your entire body, and apply liberally to the face, ears, and neck. Don’t overlook applying to feet, back of neck, and bald spots. Apply at least 20 minutes before sun exposure and every 2 hours thereafter and more frequently if swimming or sweating profusely. Avoid using sunscreen sprays on children as they can inhale the chemical ingredients. Use the lotion form only. Whenever possible, wear light colored tight knit clothing and brimmed hats while in the sun. Avoid tanning salons where damage — similar to the effects of the sun — can be done to the skin. A sunscreen that has always been a favorite of mine, and one just recently highly recommended by Consumer Reports Magazine, is a brand called “NO-AD.” This product comes with an SPF of either 30 or 45, and is one of the cheapest sun screen products on the shelves. Enjoy your outdoor summer activities, but do yourselves and especially your children a favor, and protect your/their skin from both damage and cancer by properly using a good sunscreen product. Just as I was enjoying my remission from my multiple myeloma (blood cell cancer), I was recently diagnosed with melanoma (skin cancer), which was thankfully the superficial curable kind. For several months, my hair stylist commented about a lesion on my scalp and said I should have it checked out. I eventually did see my dermatologist and the biopsy showed the melanoma. It was surgically removed and I’ve been told there should be no further concern. Enough with the cancers already. My recent experience has lead to this article on common skin cancers. Skin cancer occurs when DNA changes cause the skin cells to form a cancerous growth. Most of the common skin cancers are caused by exposure to the sun and its ultraviolet light rays that damage the skin. Even one bad sunburn as a child can increase the chance of skin cancer in adulthood. Basal cell carcinoma: The most common of skin cancers. Usually appears as a flesh colored or brown flat lesion or as a waxy pearly bump. Usually not serious and treated by removal of the lesion. Squamous cell carcinoma: Appears as a red small bump or a scaly, flat, crusty lesion. It is usually not serious, but can rarely be more aggressive. It also needs removal. – A is for asymmetry. If you draw a line through the lesion the halves will not match. – B is for irregular-shaped border. – C is for change in color, usually becoming darker. – D is for diameter (a mole becoming greater than 1/4 inch). – E is for evolving (changing). – A history of sunburns and excessive exposure to the sun. – Fair skin and/or having blond or red hair. – Moles and other common skin lesions such as actinic keratoses (non-cancerous skin lesions). A family or personal history of skin cancer. The most important thing to help prevent these common skin cancers is to avoid exposure to ultraviolet light, whether naturally from the sun or artificially from tanning booths. Remember that the sooner a skin cancer is identified, the more successful will be the treatment. I’m living proof of that. Shingles is a painful rash caused by the varicella-zoster virus, which is the same virus that causes chicken pox. At the moment, there are many cases of chicken pox occurring in our local grade schools. Anyone who has had chicken pox may develop shingles. After an episode of chicken pox, the virus can remain inactive, often for decades, in cells of the nervous system. Shingles is caused by a reactivation of the virus, which can manifest as a painful rash, always on one side of the body. The rash can be found on almost any part of the body, but it is usually a band of blisters from the middle of the back to the middle of the chest. Pain often occurs several days before the rash. Less commonly, one can have just the pain and not the rash. Most of the time, shingles occurs only once, but if it does happen again, it’s usually on another part of the body. About 20 percent of people will develop shingles during their lifetime. Shingles can affect people of all ages, but it is more common in those older than 50 and much less common in younger individuals. It is sometimes more common in those who have conditions that weaken the immune system, such as medical treatments involving the use of cortisone, chemotherapy and radiation. Shingles is not life-threatening. A full recovery is usually expected within a month or two, although one may rarely have a complication called postherpetic neuralgia. This condition causes the skin to remain painful and sensitive to touch for months, or even years, after the rash disappears. Shingles cannot be passed from one person to another, but a person with shingles can pass the varicella-zoster virus to a susceptible person, causing chicken pox. Transmission usually occurs through direct skin-to-skin contact with the blisters of a shingles rash. High doses of an antiviral drug can reduce the duration and intensity of the symptoms. Such medications include acyclovir (Zovirax), valacyclovir (Valtrex) or famciclovir (Famvir). The medicines work best when given within the first 72 hours of symptoms. Pain relievers can help control pain. This usually involves some form of a narcotic, such as Darvocet, Vicodin or codeine. Also sometimes helpful in more severe cases of shingles is the application to the rash of an ointment containing capsaicin, the compound that makes chiles spicy, or a skin patch containing the numbing drug lidocaine. Because shingles affects the nervous system, it may require a prescription of Neurontin for those experiencing severe pain. Home treatment of the shingles rash involves keeping the rash clean with soap and water, applying cold, wet compresses to the blisters, and, for those not taking prescription pain medicine, doses of Tylenol or Advil as needed. Preventatives are available in the form of vaccines. All children should be routinely vaccinated for chicken pox, as should any adult who has never had chicken pox. Although this vaccine doesn’t guarantee to prevent either chicken pox or shingles, it can reduce the intensity of the disease and reduce the chance of complications. There is also a vaccine specifically for shingles called Zostavax. It is indicated for those 60 years and older. In studies of people who were given the vaccine, the incidence of shingles infection was reduced, and in those patients who did develop shingles, the severity and duration of infection was reduced. The bottom line is that if you have a painful rash, it is better to seek treatment from your health care provider sooner rather than later. 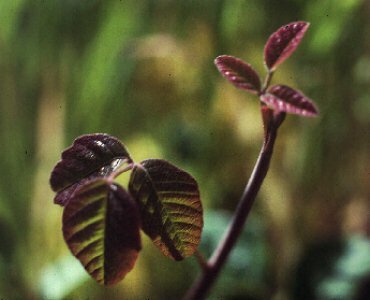 The good news about poison oak is that about 15 percent of people are immune to its effects. The bad news is that, like me, you’re probably in the other group. Over the years, I’ve treated several thousands of cases of poison oak and the one thing I’ve learned is to respect it. I’m sure poison oak was created to keep mankind humble. Poison oak is an allergic reaction caused by contact with urushiol, which is the oily sap of the poison oak plant. It is the same substance found in other poison plants, like poison ivy and poison sumac. Interestingly, it is also found in mango rinds and the fruit (not the nut) of the cashew tree. Urishiol is a colorless oil found in all parts of the plant, including leaves, stems and roots. It is so potent that it has been reported that an amount of oil that could fit on the head of a pin could cause rashes to several hundred people. 1. Direct contact: touching the sap of the plant. 3. Airborne contact: breathing the smoke from burning poison oak. There have been reports of this in literature, but I have never witnessed it with any of my patients. When urushiol contacts the skin, it penetrates within minutes. A reaction will appear within 12 to 72 hours in those of us who are allergic to it. A common misperception is the idea that a good shower at the end of the workday will be sufficient to prevent a poison oak rash. I repeat, you have only a few minutes to wash it off of your skin. The best way to wash it off is somewhat open to debate. Some medical experts would argue that water alone is sufficient to wash the oil off the skin. The water can be any temperature, as there is no proof that heat opens the pores of the skin to allow for more absorption of the oil. I have personally experienced that soap and water does the job, although some would argue that soap might spread the oil. I have never seen nor had this happen. I figure that if soap is universally recommended to use in the washing machine to remove the oil from the contaminated clothes, then it should also work to wash it off your skin. Whichever routine you wish to use, we can agree that a copious amount of water is necessary. Some authorities maintain that rubbing alcohol should be used to decontaminate the urushiol oil. I could find no controlled studies to verify this. Remember to also wash your shoes, as one common source of continued recontamination comes from touching shoes and shoelaces after they have had contact with poison oak. Also, be aware that when you take your clothes off at the end of the day to throw them in the washing machine, your hands can become recontaminated and you can thereby spread the oil further on your body. Once you have bathed and removed the oil from the skin, you can no longer spread poison oak to anybody or anything. But sometimes, no matter what you do, you’re going to end up with a rash. That’s the mystery of poison oak. Poison oak rash never becomes systemic. It is medically called a “contact dermatitis,” and the only place where a rash can develop is where the urushiol oil has contacted the skin. Poison oak rash can affect almost any part of the body. The rash does not spread by touching it, although it may seem to when it breaks out on new areas over a number of days. This may happen because the oil absorbs more slowly on thicker skin, such as the forearms, legs or trunk. Can poison oak rash be prevented before contact with the oil? Some allergy pills or shots have been used with limited success, but in general, they are no longer used, because of potentially serious side effects. I have pulled out poison oak plants while clothed from head to toe and wearing thick, heavy-duty rubber gloves washed frequently in a bucket of soapy water I keep at my side. I very carefully try not to allow my clothing to touch the plant. When my task is done, I run into the house (with my shoes left at the door), throw my clothes in the washing machine and jump into the shower. This has worked fairly well for me. Once the rash begins, you have several choices to ease the discomfort. A lotion called Technu may help some people, but not others. If the rash forms blisters that begin to weep, applying over-the-counter Domeboro as a wet compress is helpful in drying the rash. Hydrocortisone cream is basically ineffective. Mild cases can usually be tolerated without treatment and will disappear within a week or two. Depending on the severity, a person can be treated by a health care provider to heal the rash with prescription steroid creams, or if needed, systemic cortisone can be taken as pills for about two weeks or by a single steroid injection, especially if the rash involves the face. Let your provider know which form has worked best for you in the past, or if it’s your first visit for this rash, let your provider determine which method is best. In my experience, the benefit of either cortisone treatment far outweighs any risk. I’d love to hear your personal remedies for removal and treatment of poison oak. At all cost, avoid exposure to poison oak, either from direct contact with the plant or indirectly through contaminated pets, clothes, tools, etc. If known contact occurs, immediately rinse the skin with copious amounts of water followed by soap and water or an immediate shower. Wash contaminated clothes in the washing machine, and don’t forget to wash your shoes and laces as well. If your rash blisters and oozes, use wet compresses with Domeboro, an over-the-counter treatment. If you can no longer stand the effects of the rash, see your health provider and be open to being treated with some form of cortisone, whether it’s a cream, pill or shot, and then expect a fairly rapid recovery. Staph is a bacteria or germ that is causing skin infections throughout the community. It can cause lesions that resemble a pimple, a boil or just an area of red, hot and painful skin. It’s often mistaken for a spider bite. 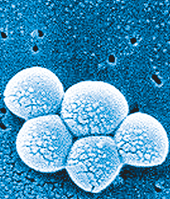 A new variety of staph is becoming very common, methicillin-resistant Staphylococcus aureus, known as MRSA. It is resistant to many antibiotics, making it more difficult to treat. Most staph infections are minor and limited to the skin. Openings in the skin, such as cuts and scrapes, make one more susceptible. Occasionally, a very serious infection can occur if the germ works its way into the bloodstream. It can also infect surgical sites or cause pneumonia. A pimple or “spider bite” that worsens over a day or two should be evaluated by a physician. Anyone can get a staph infection. We are seeing it in our own community with increasing frequency. Treatment for a staph infection can be as simple as having a doctor drain a boil. Antibiotics are often given, as several are still effective. One must take the entire dose of medication unless otherwise directed. Do not squeeze a pimple or boil. Typically, this will only spread or worsen the infection. Wash your hands often with soap or an alcohol-based hand sanitizer, especially after being out in public. Keep all scrapes and cuts covered with bandages. Do not share personal items such as clothing, towels, razors, etc.